Is there a more important milestone to your business than finding the first person who will pay you? Payment comes in many forms, but let’s talk about the most important form—actual money. You can gather “eyeballs” as much as you want, but at some point, you have to start getting paid. The pace of this is different in every business, but the end goal is always the same. The difference between a small business and an entrepreneurial business is in the growth rate. An entrepreneurial venture requires rapid growth, and often requires a jolt of early capital to make a run for it. Think of how that might change your content strategy if you think of your investor as a customer. The story you tell is different than what you’d tell your consumer customers, right? Small businesses are built for content marketing because generally, after a race to the threshold of sustainability, incremental growth is satisfactory. So your content strategy might be designed around getting some early adopters on board so you can start earning revenue, and then inspiring and empowering them to advocate for you—to create new customers for you. In each case, the content—and the strategy around it—should match the goals. 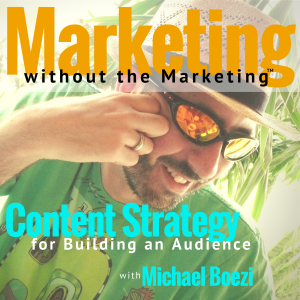 This episode is about getting really clear about whom you are trying to serve and making your content work towards the singular goal of earning your first customer. I’m quoting from an article by Henry Blodget in Business Insider, but there’s a lot written about this—including this piece from Y Combinator about their portfolio stats. It’s hard to measure success since definitions vary so wildly, but we can agree that it’s hard to get a business off the ground.